Whether you’d like the freedom to return to a hobby you love of you’d simply like to be free of pain, Vitaphysical can help. From our base just 20 minutes north of Castle Eden, County Durham, our friendly osteopath and massage therapists provide relief from pain and encourage relaxation. First opened in 2007, Vitaphysical was formerly known as Sunderland Back Pain Centre and though we still treat thousands of patients to cure them of back pain as well as frozen shoulder and neck issues, we now offer a far more comprehensive service. Our specialists deal with everyday issues such as headaches and posture problems and also work with those who are recovering from accident or injury. 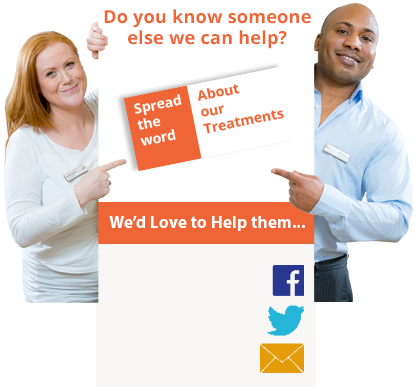 To get a fuller picture of all the conditions we offer treatment for, you can visit our what we treat page. Many of our massage therapies are designed to improve movement including our deep tissue massage. Thai massage and sports massage. If relaxation is your aim, our massage therapists can soothe and help you unwind with a relaxation treatment. Sports massage specialist Kirsty works with athletes who want to prepare or recover from sporting events. She also works with mums to be, easing pregnancy discomfort and pains and promoting relaxation. Patients come to Vitaphysical from Castle Eden and beyond for help with all kinds of problems. We find that some have already undergone treatment elsewhere. After undergoing physiotherapy treatment with limited success or visiting a private chiropractor, they reach us through word of mouth recommendations. Our patient success stories page shares some of these experiences. The Vitaphysical massage and osteopathy centre is approximately 20 minutes’ drive from Castle Eden. Free patient parking is available on site and you will view a map on how to find us page. To arrange a massage or osteopathy appointment with us, you can use our online booking system, call for a free telephone consultation on 0191 565 886 or send us an email at info@vitaphysical.co.uk to discuss your personal situation. We recognise that pain often strikes without warning and for this reason Vitaphysical is able to offer a number of emergency appointments, usually on the same day or within 24 hours of your call. And for your peace of mind, we offer a 100% money back guarantee on all courses of treatment.